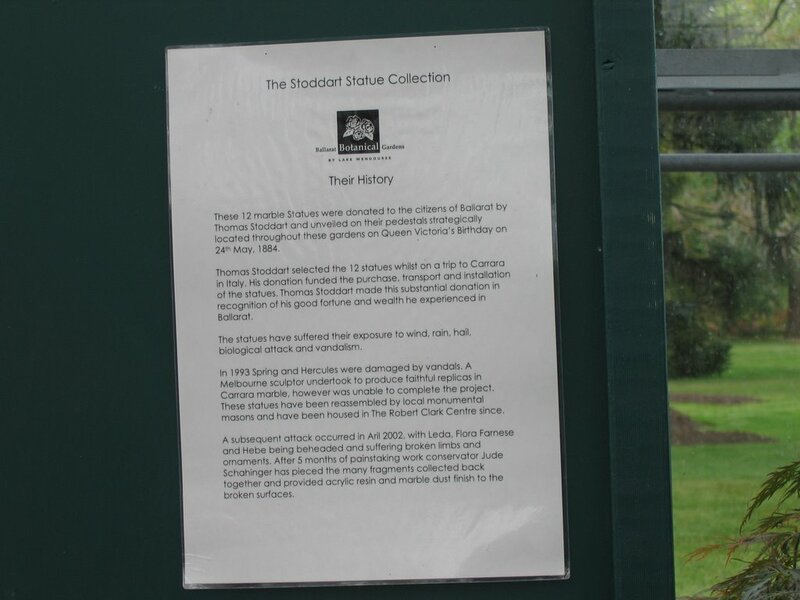 When I was at Ballarat on the weekend we visited the Botanical Gardens and I got lots of little clips of the sculptures and statues there. I was really saddened by the ones that had to be housed in the greenhouse building and had been vandalised. I don’t understand why people would destroy public property that is so beautiful and a gift for everyone. This photo may need to be enlarged to read the history of the statues. I will be adding to the revver collection of Ballarat Sculptures so if you are interested check back. I spent the weekend in Ballarat. My brother was married on Friday there and we spent the weekend, since we were there. It was a great family occasion. I feel pretty blessed by my large extended family. I was chatting to my cousin and a brother at one stage of the night and we all agreed we were pretty lucky in the family department. Our family gets together and has a good time. The wedding was very beautiful and I was proud of my brother and his wife and the way they expressed their committment to each other with such love and pleasure. I haven’t been to Ballarat for a long time. In fact I think it was an excursion when I was doing my HSC (contemporary VCE or Year 12). I don’t remember much about my previous visits and I enjoyed seeing Ballarat now. It had a spacious and gracious feel to it. The old houses are distinctive and individual and the streets are wide. We enjoyed the place we stayed at and visited the Botanical Gardens on the Sunday before heading home. I will put some video’s up on revver. I took mainly videos of the sculptures in the park. Went for a drive today to look at some properties for sale. It was a very spring kind of day and there is an amazing view from Carrajung that we enjoyed whilst having a yummy picnic on what was probably once an oval. It was framed by tall trees and I can’t believe now that I didn’t take a photo. Too distracted by the view I guess and by daydreaming about what could happen in that space. It was warm, sunny and delightful.